Long beards are fashionable, but they can become wild and tangled if left to their own devices. A beard trimmer is a great way to curb that kind of unkempt growth, but how can you find the right trimmer when the market is saturated with all kinds? To save you time (and potentially money! ), we put this guide together to bring you the best research and know-how regarding these facial hair enhancers. We’ve found the best trimmers on the market that can provide you with versatility and enough finesse to work with long, thick beards. Cheap, easy to adjust, and ergonomic. Multiple functions for an affordable price. Before we dive right into the best beard trimmers, there are a few things to look out for that can confirm whether or not a trimmer is worth your time and money. These are universal factors that affect every trimming experience. Waterproof: If your trimmer is waterproof, you can take it into the shower. This isn’t necessary for long beards, but it can help when it comes time to trim them down or to finish your shave by removing smaller hairs close to your beard line. It also makes cleaning the trimmer easier, since you can dunk the entire thing in the sink. If your trimmer isn’t waterproof or is just water-resistant, only submerge the detached heads for washing! Otherwise, you might damage your trimmer. Number of Attachments/Heads: More head attachments are always great, although you have to store them somewhere. Larger heads are great for long or thick beards, so always target a trimmer that has at least a few settings. Each of the trimmers on our list has heads suitable for chopping away at longer beards. 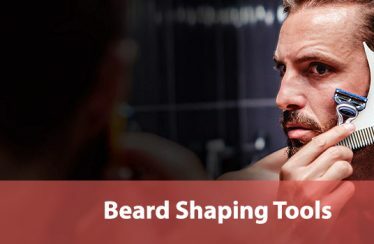 However, you also need heads for shorter beard trimming, since tightening your beard and evening out its hair is important after you cut away the longest parts. Number of Settings: This refers to the ways or lengths in which your blades can cut. The more settings you have, the better you can customize your favorite trimming length. Some trimmers only have one setting, but multiple heads; these fulfill similar functions in reality, so it’s good to have either multiple heads or multiple settings. Charging: Most trimmers are wireless, although some must be plugged in to be used. Always go for a wireless option if possible. In addition, trimmers with good charge and run times will be higher in our eyes, since that reflects less time you might have to spend waiting to finish your trim. Stainless Steel: If you have sensitive skin that reacts poorly to nickel or other metals, find a trimmer made with stainless steel. This is a hypoallergenic material that won’t irritate your facial skin when used. We’ll start with a quick overview of the best picks for trimmers that can work well with long beards, then dive into each model’s specifications. 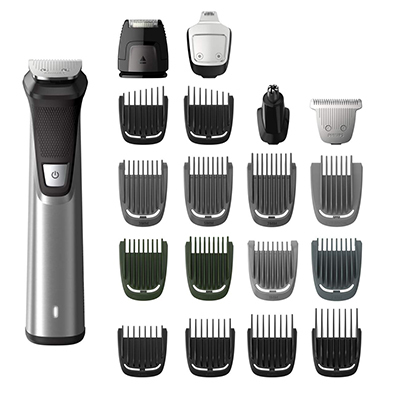 The Braun BT 7040 is a trimmer that focuses on precision and customization. Many beard trimmers make do with a few settings and blades that are only suitable for rough hair. The BT 7040 uses ultra-sharp blades to cut beard hair of varying lengths and comes with 2 combs to straighten and smooth your beard after it’s been trimmed. The 7040 comes with 39 different length settings, proving its focus on user customization and ultimate comfort. Because the blades are so sharp, having the right setting for your exact beard length is crucial. 39 settings should be enough for virtually any beard style and shape! The heads can be switched out depending on your beard length. If you have a long beard, you’ll like the variety at your fingertips. These settings are controlled via a dial at the top of the trimmer. While this can be a little crowded, figuring out the right setting only takes a moment of experimentation. 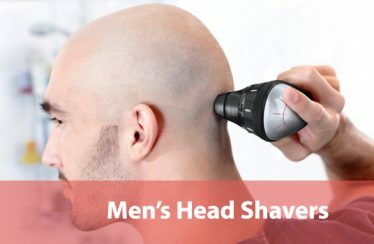 A hair trimmer head and beard trimmer head allow for focused cutting of those particular areas, too. Included with the trimmer is a Gillette Fusion5 ProGlide razor to complete your shaving experience; it’s always good form to make sure that your stubble is taken care of when you trim your beard to keep your entire look clean and focused. The trimmer is wireless, so you don’t need to keep the trimmer plugged in as you use it. You can charge the battery from zero to one hundred percent in about an hour or plug it in for a quick minute for a fast shave if you’re in a hurry. A full battery will last you for around one hundred minutes! The BT 7040 also comes with a great charging stand and cable. This makes for easy storage and prevents your trimmer from having to rest in awkward positions around your sink. A zipper bag and cleaning brush complete the included accessories. We really like that the trimmer purchase includes so much value for its price. The price is a little high compared to similar trimmers, but keep in mind that you’re getting a handful of excellent accessories with your purchase. Overall, the BT 7040 is one of the best beard trimmers we’ve ever seen. This trimmer is a bit different from the Braun BT 7040. 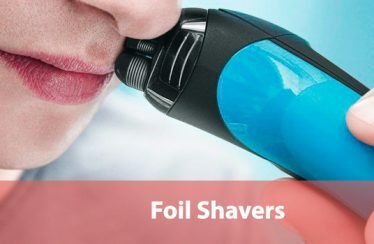 It provides a varied shaving or trimming experience depending on your needs, but it uses different heads and combs to change the cutting of its blades rather than adjusting the blades themselves. There are nine different ways to use the Srocker Trimmer, including four different combs that can position your hair just the way you need it. The blades are very sharp, as with the Braun 7040, and are easily replaceable as they lose their edge over time. A quick thumb button allows for easy removal and disposal in a trash can; replacement blades can be snapped on just as smoothly. The metal used in the trimmer’s construction is stainless steel, a hypoallergenic material that’s ideal for those with sensitive skin. Charging the Srocker trimmer can be done via an adaptor cable or the charging stand, and a full battery will net you about an hour or so of use. The exact amount of power depends on the head you’re using and the thickness of your beard. The charger comes built into a wide stand that can store all of the various pieces that come with your purchase. This can be a bit much for crowded sink surfaces, so if you’ve got a tiny bathroom you might find all of these selections frustrating rather than helpful. The Srocker trimmer is a great choice if you’ve got a wide bathroom sink and like to alter the length of your beard frequently. All of its attachment heads are great for handling the developing needs of a changing beard. Here we have a great product in terms of value for money. 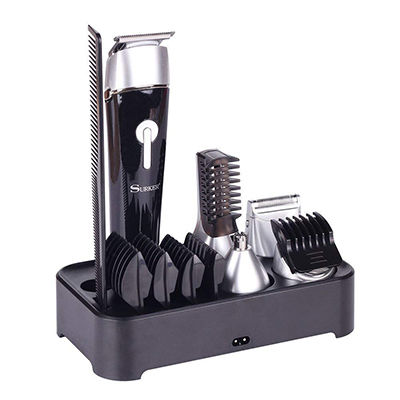 The SUPRENT Kit is a 5-in-1 product that has a single centralized trimming unit that can be fitted with all kinds of heads to focus on different hair-care needs. There’s a nose hair trimmer, a body trimmer, a beard shaver, a precision trimmer, and an ear trimmer! All of these different heads are all used with the same base unit. This does mean that you’ll need to switch heads for every type of trimming you do, but the value provided by the entire kit is phenomenal. Given its low asking price, its worthiness as a buy for those trying to stay within budget is excellent. The trimmers all use excellent, durable blades that are made with 420 stainless steel, and even more hypoallergenic steel than the Srocker trimmer. It’s also totally waterproof, so you can feel free to take this kit into the shower and remove hair from your body under ideal conditions. The charging stand is a bit large but it can provide you with a place to store all of the extra attachments that come along with the trimmer. A full battery will net you about an hour’s worth of run time that will vary depending on what you’re using the trimmer for. Overall, the SUPRENT Kit provides excellent flexibility and versatility for any man’s facial hair care routine. It’s essentially a bathroom collection in one. Few men will need to purchase additional hair care products after they buy this 5-in-1 kit. 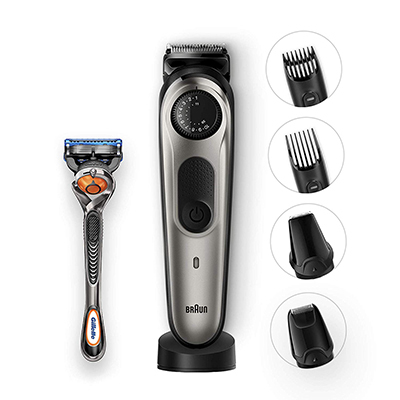 Even better in the value department is the Shao Electric Shaver and Beard Trimmer kit. Like the SUPRENT kit, it’s alsoa 5-in-1 product that has the same assortment of excellent hair care heads to be added to a central trimmer model: nose trimmer, body hair trimmer, beard trimmer, ear trimmer, and a micro trimmer for very precise shaving and contouring. The stand for this kit is much better than the previous trimmer kit. The stand is more compact and thinner, allowing it to remain on a bathroom sink without taking up so much space. The trimmer heads and attachments all fit into their places snugly. Charging times are a bit poor, as it takes about 8 hours to go from no battery to a full one. However, once filled, the trimmer can run for around 70 minutes without stopping. We recommend leaving it charging when it’s not in use. The heads can all be changed very easily on this trimmer, too. Simply press your thump to the top release and snap new ones into place when you want to switch trimming styles. This functionality adds to its overall value. It’s an affordable, versatile kit that’s only limited by the lackluster charge time and the handle, which isn’t very ergonomic. However, when it comes to maximizing value for money spent, you can’t find much better than the Shao kit. The Ceenwes 5-in-1 kit is a great pick if you need the best budget beard trimmer you can find. This extremely-affordable kit comes with the standard assortment of trimmer heads to help you tackle all of your facial hair care needs: nose, beard, ear, and close shaving. It also comes with two guard combs of different sizes. These combs can help you manage the right length of trim no matter how your beard initially starts out. All of the heads and combs are very easy to adjust with a slider that’s just beneath the heads. The slider clicks audibly as you move the neck of the trimmer up and down, so finding the right length for your facial structure is intuitive. Charge times are really good with this kit. You’re looking at about a 60-minute charge time for 45 minutes of run time. The handle is ergonomic and feels great to hold. A small downside is that the material that makes up the heads is a little cheap-feeling, which may lead to replacements as they’re used. The heads can all be washed with water, but the trimmer itself is susceptible to water damage. Keep this trimmer away from the shower at all costs and only wash the heads when they’ve been detached from the main unit. Overall, the Creenwes Kit is a good budget pick that offers a lot of utility and value in exchange for a few minor shortcomings. It’s not enough to prevent the trimmer from being a great product, provided you keep the warnings about water damage in mind. The Hatteker trimmer is a work of art. Its quiet, powerful motor can deliver exceptional shaves and trims for beards of any size and length thanks to its setting wheel, which can be turned and tuned by the millimeter to provide you with the ultimate choice for your beard. 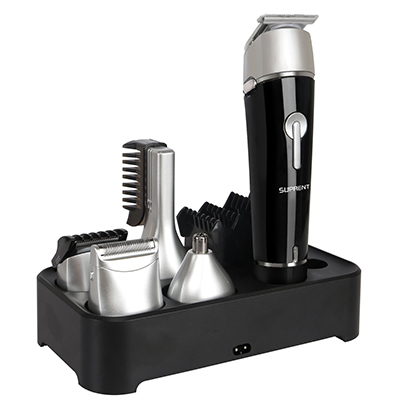 It comes with 6 different tools or combs to streamline your trimming experience. The charging is phenomenal as well. For only 90 minutes of charging time, you’ll receive 2.5 hours of run time. This is one of the only trimmers that has a longer run time than charge time. The stand is also quite compact and narrow, although there isn’t room for all the attachments so you’ll need to find storage for them separately. You also get a comb for your hair and a cleaning brush for the entire kit and the blade, which is made from ceramic titanium. This material helps keep the blade sharp for longer periods of time than competitors’ blades, provided that you wash it regularly once it’s been detached from the main trimmer. The waterproof trimmer can be taken and used in the shower, too, if you like to get really close shaves that smooth your skin. The trimmer’s motor works really well with the various attachments. The one minor flaw we saw was with the rotating setting wheel above the main LCD screen. The wheel could slip at times, which would be frustrating for anyone trying to get a precise shave. 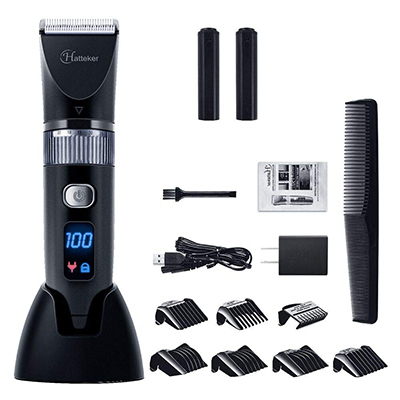 However, all of the Hatteker’s features taken together make it a trimmer to be reckoned with, especially seeing how affordable it is. This is certainly an excellent choice if your beard requires fine trimming or a close blade to perfect your unique look. The Norelco 7750 offers one of the most versatile shaving experiences on the market. 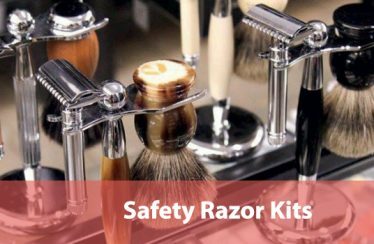 It comes with a whopping 19 different tools to help you find the perfect shave no matter your beard style. 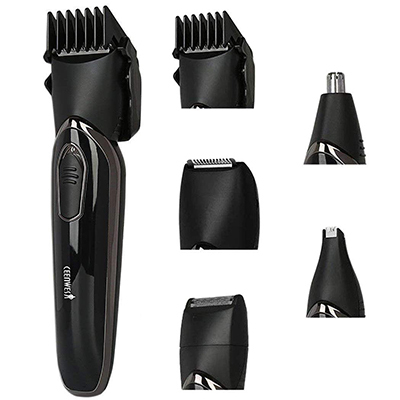 There are combs, attachable heads, and trimmers with narrow bodies for cutting hair at virtually any angle and length. The heads and tools are all washable, along with the trimmer itself, under a faucet for easy maintenance. It’s blades, made from DualCut technology, are long-lasting and are equally sharp no matter which direction you’re dragging the trimmer. The handle and overall design are simple and stylish, which we really enjoy. It’s also made from stainless steel, so it’s a good hypoallergenic option if you have sensitive skin. The battery rate is fantastic. For only 2 hours of charging you get 5 hours of runtime, making this a great trimmer for traveling. The lightweight trimmer can be charged, the heads you like collected, and safely used over an extended period without you having to worry about it running out of battery. The number of attachments is a lot to handle, especially at first when you’re figuring out which ones work best for your beard. Since there’s no case or storage stand, their place in your bathroom is totally up to you. This is a really minor flaw in the face of an otherwise-fantastic trimmer. Finally, let us give you some quick tips about how to best use your new beard trimmer. There’s a technique to this stuff, and any mistake might take some time to grow back! For longer beards, especially, be careful not to start with something too small. Begin slowly, and consider using a beard shaping tool or similar assistant to get a feel for the right attachment for your beard. You also don’t want to use a head that’s too large for your beard; you’ll just be wasting battery life. For a full trim, cut off larger sections of your beard with bigger heads or attachments, then follow up with smaller ones. You can finish the edges of your beard or make your lines neater after the broader work is done. 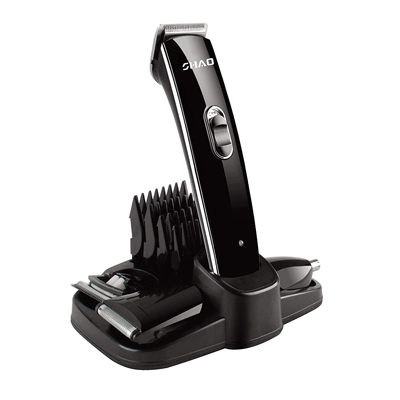 When not in use, your trimmer should be resting in it’s stand or plugged in. You lose nothing by letting it remain at full power, and some trimmers take some time to recharge all the way. Remember to plug it back in between trimming sessions! This applies to non-waterproof trimmers. Take care to detach heads before you wash them if your trimmer can’t take a lot of moisture. Usually, this is an easy task, as most trimmers have an easy-release button for switching or removing attachments. We hope this guide has been useful and pointed you towards the perfect trimmer for your beard. Even if you’ve got a thick, lengthy beard, you can use a trimmer to maintain it at the perfect level or shave it down to something more manageable. Thanks for reading!